Click the left and right arrows to browse through all of our before and after pictures at Gallery Dental Centre in Whitby! Placement of implants to replace missing teeth and 20 crowns. Scroll to the bottom crowns and 6 implants. 4 front crowns. Now this patient is smiling with confidence. 3 veneers to match an existing bridge. Implant to replace a missing tooth in the esthetic area. 4 root canals, fillings, 2 bridges and crowns in the top and an implant on the bottom - all done in one appointment. Before and after of a teenager, who is now one confident young man. 'Snap On' smile - a removable prosthesis to replace missing teeth and improve the look of existing teeth! 11 crowns and an implant in the upper jaw. Keep checking for the lower jaw. 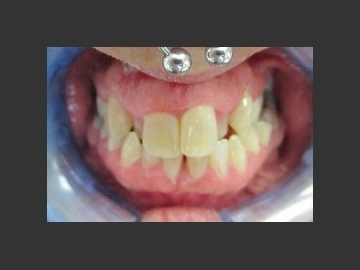 This patient received 4 front crowns during cancer treatment. Now he is completely cancer free and has his smile back! The lower jaw from the first case. 7 implants and 6 crowns. Invisalign. No 'train tracks' for this adult patient! Sorry about the rotation! This young man had a car accident and as the result had lost his front tooth. He had an implant with immediate temporary crown placed. Implant to replace a congenitally missing tooth. This young patient had to wear a removable retainer to replace his missing tooth for many years. Implant-supported bridge. No more dentures with metal clasps! 1 crown and a five unit bridge. New! Snap-on Smile, before and after. Improve the cosmetic appearance of your smile without the expense of crowns or veneers. Another successful Invisalign case completed by Dr. Pesin!